This post is dedicated to Jenny for telling me that my book signing post was "so last month" and I needed to update it! Since Will and I are spending Christmas in Europe we did Christmas with my family during Thanksgiving. There were 3 major projects I had to finish and I'm happy to report that they all got done (although I was cutting it really close!). 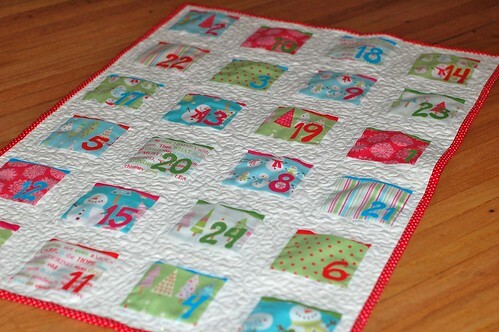 First up - Shay's Advent Calendar. Growing up we loved Advent Calendars!!! Even the cheap ones with the bad waxy chocolate were just so much fun. When I saw this project on Oh Fransson's blog I knew I had to download the pattern from SewMamaSew. 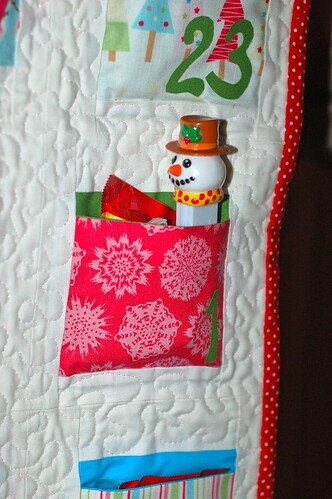 Modifications: I used Prints for all of the pockets fronts instead of mixing with solids. I also used 4 solids instead of the 3 the pattern called for. 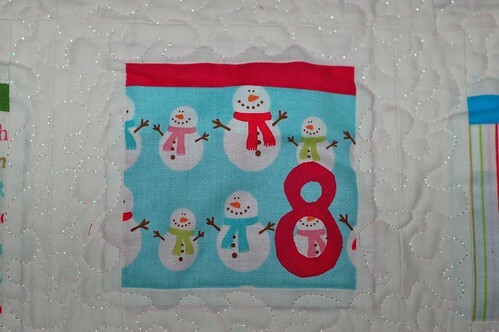 To save time, I did not stitch around the fused numbers (I used Steam-a-Seam 2 to make sure they were really stuck on). I quilted it using a Metallic Sulky Thread (which is prone to breaking, so it's definitely a lesson in patience and the right needle size). The stippling is done pretty tight which added some much needed texture to the wall hanging. Close-Up of the pocket - it's really amazing how much each one could hold. I put a Halloween sized skittle in each one along with another surprise. 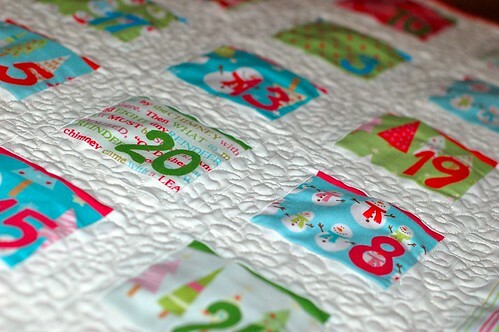 I have enough fabric left over to make another calendar, I can't wait to get started on it after the New Year! Beautiful! I will buy your stuff too. Ditto! I LOVE advent calendars too! 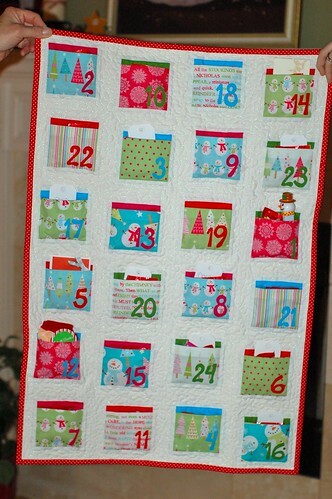 Your advent calendar looks great!! These were the other fabrics that I was considering for ours, but I asked Will for his opinion and he picked Funky Christmas. I did use the pink snowmen and pink stripes in flannel to make pj's for my daughter and a friend's daughter- they are so cute! They are getting them for Christmas tomorrow, so pictures will go up after that. Have fun in Europe! LOVE, LOVE, LOVE the calendar!!! !